I thought about making a sloth climbing on my tree; when I realized that copper wire hair would patina to perfect sloth color, it was a plan. Sloths are funny; they are the only animals with hair growing away from their feet. Dale Lewis was an electrical technician and machinist who worked for a specialized machine builder. After leaving the work force, he found himself with time to experiment with making mosaic sculptures. 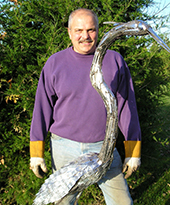 Five years ago Dale bought equipment and started welding metal sculptures. His hobby has become a full-time obsession.